To start, let’s pull up that chart. Now, I cannot remember where I got this chart and can’t find it online, so… The information may be out of date, but it’s what I have, so, let’s go with it. As a reminder, my starting weight was 317.5. What I consider to be my ‘excess weight’ is anything that puts me over a high-end normal BMI of 25. At 5’7″ that is 160 pounds for a woman. That means my excess weight was 157.5 pounds. From there, I plugged in my own pounds to have lost by certain milestones. This chart only goes out to 5 years post-op, but I’m 7 years post op. My current weight is 202.5, with an all-time-low of 183. You can see that from this chart, my being at 183 was below any average expectations, even though it isn’t my goal weight of 160. There ARE people who lose ALL of their excess weight, but it’s not 100% expected. At 2 years post-op I was comfortably below the 2 year average, and 5 years post-op I was comfortably below the 5 year average. I will fully admit that the fact that I am again gaining is a bit terrifying, but I can also admit that I have slid back into some bad habits. I could partially blame it on a medication change (one of my medications was going to be $200 out-of-pocket each MONTH, so we had to change it to something I could afford when my insurance changed in March), moving twice in 11 months, buying a house for the first time, job changes, etc. etc., but I think it’s also dangerous to put the blame on those things since blaming is generally how we get to our weight situation in the first place. So, I’m going to try to do better. I had gotten into the habit of going ahead and eating simple carbs when I didn’t need to, and snacking way more than I should. I know that I have a carb-addiction-type body chemistry, so I’ve decided to avoid them as much as humanly possible until dinner time. I have noticed that, with this, I am much less likely to get afternoon snack cravings. Instead of having leftover dinner for lunch, which may involve carbs, I have a salad with good greens and protein, and now, frankly, I get cranky when I can’t have my lunch salad, lol. When we do go somewhere for lunch where I cannot as easily control that, I do find I am much more likely to want to snack snack snack later. I also know I don’t get much exercise. Again, it sounds like I’m making excuses, but when I do get lots of steps in (well, lots for me means 5000+) I HURT. I have arthritis and fibromyalgia. I *like* that I CAN do longer days like around the local amusement park, walking around the mall, etc., but I do not like that it can put me completely out of action for days afterwards. I don’t honestly know if I could even keep up with a regular exercise regimen without my body betraying me, but I will try to figure something out. Okay, lots of math coming. You have been warned! With this, I crunched numbers again and decided to see what my goal weight ‘should’ be if I was on track for where the averages expect me to be 5 years post op. That says that if my goal weight were 144 pounds (BMI 22.5) I would be right where the averages are for 5 years post op. So, now that your brain hurts from all the math (at least, mine does), um, bye! Yeah, I’m still here. Just not much to say. In short, the scale a year ago said 187 and it has ranged between a high of 193 and a low of 183 for that year. See those rows highlighted in red? That’s what I’m between right now. It means that, on average, I would be perfectly fine and considered a surgical success between 197.4 and 205.27 pounds. I’m at 184.5 with a high this past 12 months of 193. Again, I’ve said it before, many many many people lose MORE than the average, losing ALL their excess weight, plus some. Some lose LESS than the average. I’m pretty happy to have lost more than the average, although not all of my excess weight (as a refresher, in my case I define that as any weight that puts me over a high normal BMI of 25, which is 160 pounds for me). To reach my goal weight there’s still about 25 pounds to go. When I started this, that 25 pounds seemed like The Great Wall of China. During my journey it went down to more like a picket fence. Now, it’s The Great Wall of China again, but I’m more content to let that wall be. I just realized that I made almost this exact same post a year ago – (Perspective) – so I guess it’s good to know I still feel the same way, lol. Since I’m not providing as much in the way of inspiration and recipes, let me direct your attention to two blogs I follow for MY inspiration when it comes to what to eat, etc. If you don’t already follow these lovely ladies, I highly suggest it! Wow. It’s been two years. I haven’t quite reached my final goal, BUT, I’m relatively okay with that. Today I’m at 189. A year ago I was at 197.5. The lowest I’ve been was 185.5 back in January. So I guess you could say I’m kind of in maintenance mode (although I was 185 in January, I’ve been consistently a couple pounds up or down of 190 since about March) or a reeeeaaaalllly long stall, lol. If you look at the chart that lists the average weight lost after surgery, it says that at the 12 month, 15 month, and 18 month marks people have lost an average of 73% of their excess weight. At 24 months that number is 76%. I’ve lost 81% of my excess weight. Are there people that have lost it all by now? Sure! Do they have some magic secret? No… Are they any better than me? Nope, just different. Am I happier and healthier. Heck YES. Last month I went to the mall and a ton of stores were having sales. Lane Bryant was closing so I went in. Not a lot of stock left, but there was almost NOTHING in the store I could wear anymore. I’m at the bottom of their sizes now when I used to be hovering near the top. I went into CJ Banks because they were having a sale and while there were things I could wear, again, it was almost the smallest size they carried. Fortunately, I remembered that there was a Christopher Banks in that mall as well (the non-plus size version of the same store). I found a dress in a size 16 that I loved. And it was too big! I tried the 14. It was better but I decided to go see if there was a 12. Now, there wasn’t so I’m not sure which would have been the better fit, but still, I was amazed that I even had that option. Another store was having another sale – Size L dress. Not 4x, not even XL in this case – L. (Different cuts mean that sometimes a XL is the fit on top or bottom, but sometimes it’s L). Health wise, it’s fun to watch the blood pressure monitor at the doctor’s office. I never had high blood pressure (except when I was giving birth to my daughter, but that’s another story) but it hasn’t been this low in FOREVER. Sometimes the alarm goes off because it’s ‘too’ low, it’s kinda funny. My knees are permanently damaged due to the abuse I have put them through (ballet and weight), but getting 125+ pounds off of them has made them much happier. The first time we came to our zoo here in Utah 3 years ago (so a year before surgery at 300+ pounds), we parked in the upper lot which meant a hike up a hill to go home. And I was MISERABLE. This past week we wound up parking in the upper lot again. And it was soooo much easier. This fall we’re going to Disneyland as a family. For the first time ever I will likely NOT be looking for a place to sit down every few minutes while there. I won’t worry about squishing into the ride cars (which is doubly good since it’s likely my 3 year old will want to be held on a lot of the rides, something that would have been almost impossible at 300 pounds). I will have to worry a bit about what to eat, but I’m armed with KNOWLEDGE! So, bottom line, yes, I still really would like to lose those last 30 pounds, but I’m still VERY happy with how far I’ve come. In just over a month it will have been 2 years since I had my surgery! Instead of answering questions I made up, I’d love to answer questions people actually have. So. ASK ANYTHING. Really. Even if you think you know the answer, ask it! I don’t guarantee that I’ll answer every question, but for the most part I’ll answer pretty much any question there is out there about my surgery and life since it. Yes, I’m cheating. This isn’t really a blog post, more a shameless plug. Sort of. There is also this one, where I kept ones that are vegan / vegetarian / pescatarian during Lent. Most if not all should also be WLS friendly. Why has no one told me about these? 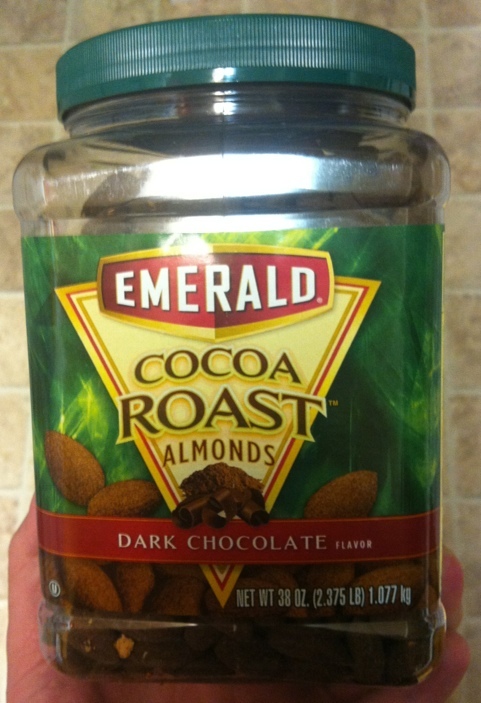 They have the same nutritional content as regular almonds, but with a dusting of cocoa slightly sweetened with sucralose – and they’re YUMMY. I found this large container at my local Sam’s Club for $10. I know, meatless jerky, yuck! Right? This stuff is GOOD. I was wandering through Whole Foods the other day and remembered that I had seen a meatless jerky (‘jerquee’) mentioned by someone. I hadn’t been able to find the brand they had mentioned yet, so I thought I’d try Whole Foods. Seemed logical. They still didn’t have that brand, but they had another brand. Primal Strips by Primal Spirit Foods. The base is either soy, seitan (gluten based protein), or shiitake mushrooms for their 6 flavours – Teriyaki (seitan), Mesquite Lime (seitan), Hickory Smoke (soy), Texas BBQ (soy), Hot & Spicy (shiitake), and Thai Peanut (seitan). The seitan based ones are, of course, NOT gluten free, neither is the shitake based one, but the soy based ones ARE gluten free, for those with gluten issues. When I asked someone about meatless jerky at Whole Foods, they not only showed me them in the store, they actually opened up a package so I could taste it right there. I was impressed, both with their customer service and with the product, lol. It was the Thai Peanut which is one of the seitan based ones. It was yummy and I was SOLD. I brought home the Thai Peanut, Hickory Smoke (tasted, yum), and Mesquite Lime and Texas BBQ, neither of which I’ve tasted yet. They have between 6 and 11 grams of protein per serving, 74 – 108 calories in a serving, and 3 – 5 grams of sugar. Oh and between 7 and 11 grams of carbs. One HUGE plus they have over meat jerky is that they’re SOFT. With even some of the best jerky out there I could chew and chew and chew and it wouldn’t feel chewed enough. If I got a particularly gristly piece – forget about it, I’d have to spit it out. So. Yeah. Go check it out. They’re at Whole Foods, but at other local stores too. So, again, this is something I first saw on Pinterest. Here is the blog link. Yogurt is big in our house. I eat it for breakfast a lot and both kids like it. So, when I saw this, I thought “I gotta try that”. This is a process that’s a minimum of 13 hours start to finish. 5 hours cooking & cooling, another 8 hours ‘growing’. I start it at about 5:00pm or later the night before and have yogurt in the morning. Just figure when you want it to be ready (unstrained) and subtract 13 hours, lol. I use 1 cup unstrained in a smoothie in the morning and then strain the rest (more on that below). 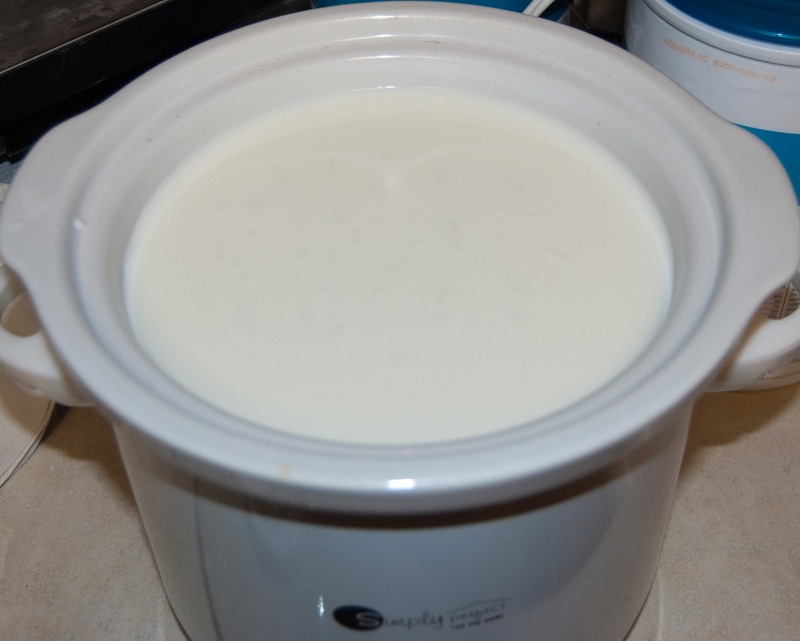 Pour the 8 cups of milk into your slow cooker. I have one that is the perfect size to just fit it all. Now comes the growing part. You want to keep it as close to 110-115 degrees as possible for 8+ hours. 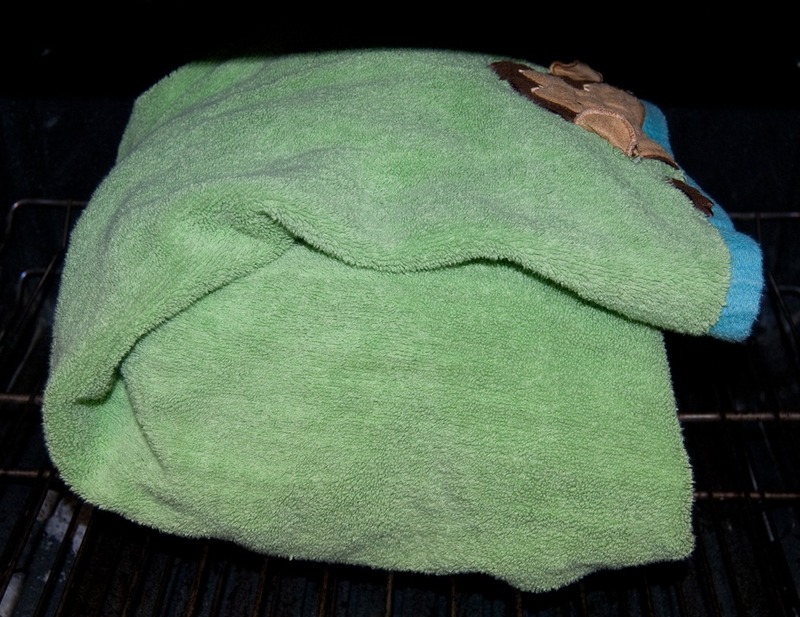 I wrapped mine in a towel and put it in the oven WITH THE OVEN OFF. This just kept it out of the way, out of drafts and in an insulated space. At this point, it’s 100% ready to eat. However, it is thinish. 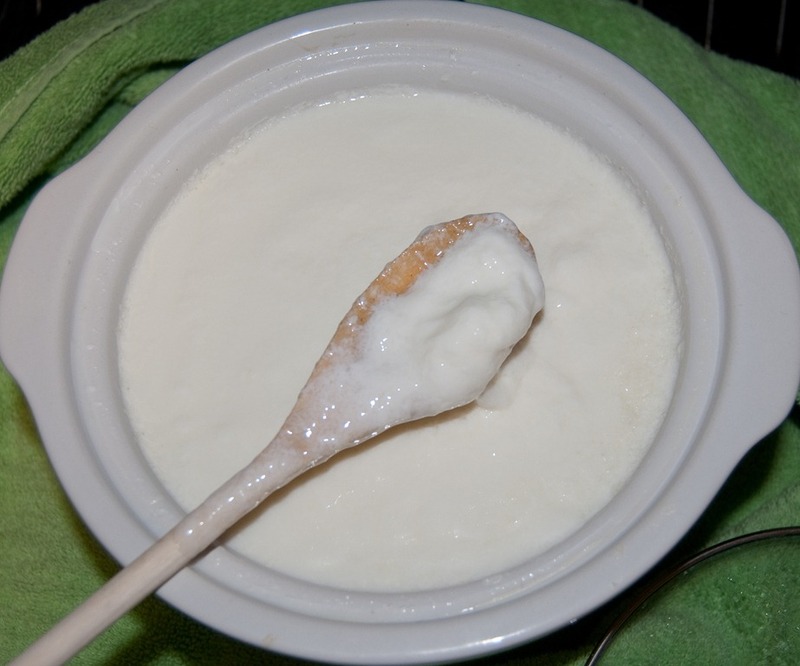 If you want a thicker yogurt, strain it. 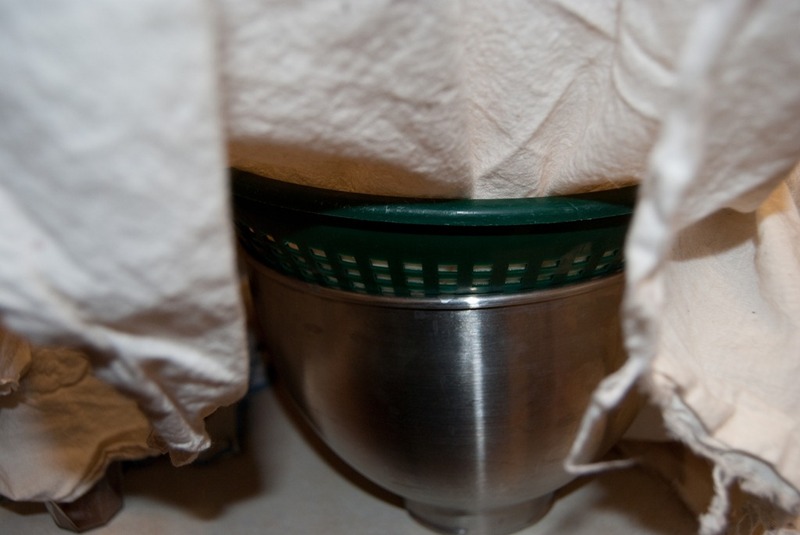 This involves a piece of cheesecloth, muslin, or even a coffee filter, placed in a colander, and put over a bowl. 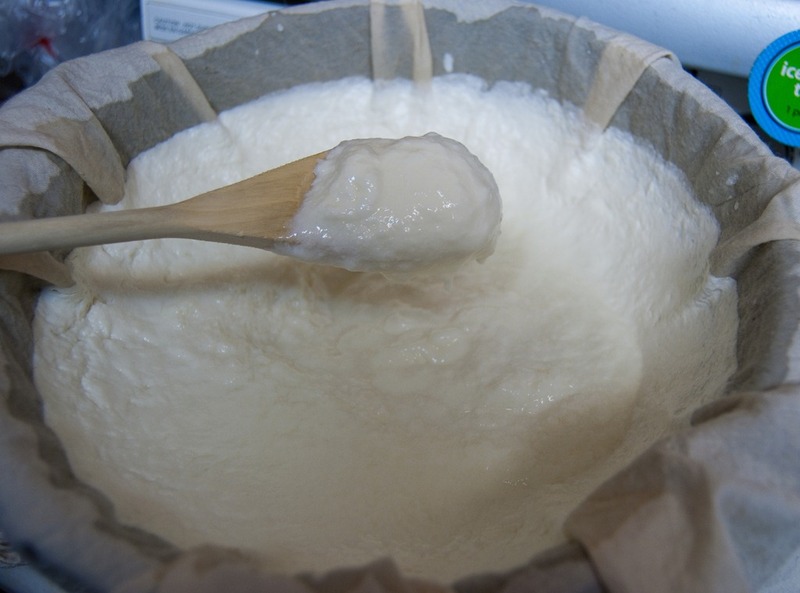 I used a piece of cheesecloth the first time, but could see that cleaning it would be a pain over time. I had a piece of medium weight muslin in my fabric stash that I decided to use instead. Worked wonderfully. 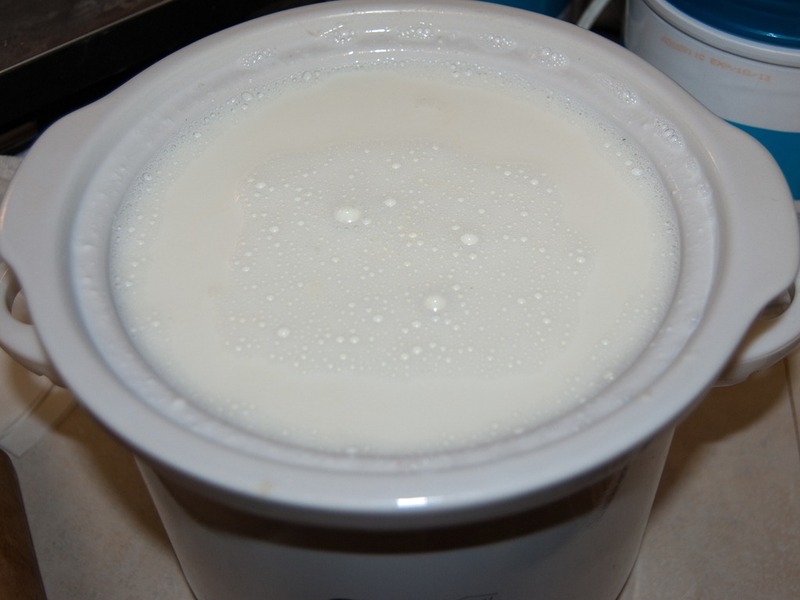 This is how much strained yogurt I wound up with, this is a 3 1/8 cup container. There was about a cup more that didn’t fit. 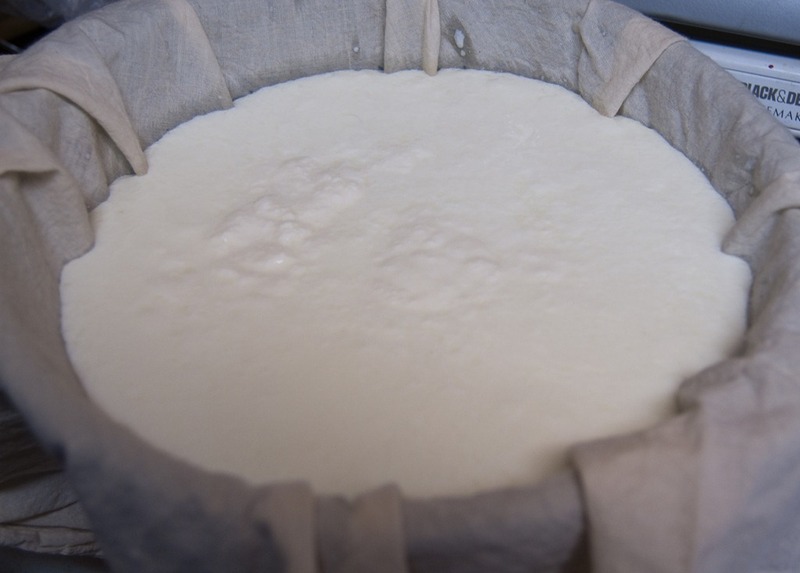 The whey that is strained out at the bottom is USEFUL, don’t just throw it away. Put it in a jar or container and keep it. 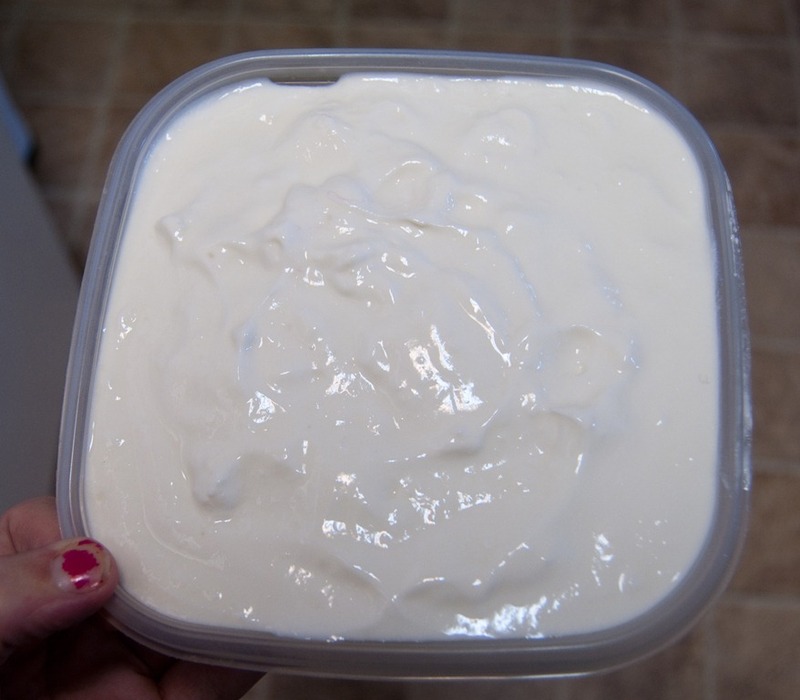 This is a quart size Mason jar, so you get about half yogurt and half whey if you strain it as much as I do. If it’s still not sweet enough when it’s all done, feel free to add more. You can also add jam, pureed fruit, cut up fruit, whatever. My 2 year old daughter loved it just like this. A little imitation honey (because I can’t handle full sugar) and vanilla and she was a happy camper. As many of my friends have reminded me by posting about their girls’ upcoming sales, it’s Girl Scout Cookie time again. I love Girl Scout Cookies. In some ways it’s the cookies themselves, in other ways it’s the memories of my time in Girl Scouts myself. It’s a list of protein shakes designed to mimic the flavour of the cookies, minus the actual cookies. It also mentions ways to support the cookie selling effort without having to actually take the cookies home and stare you in the face. Disclaimer – I haven’t actually tried any of these recipes yet, which includes versions for Thin Mints (my favourite), Samoas, Tagalongs, Do-so-dos, and the new lemon cookie – Savannah Smiles, but you can bet I’ll be adding the ingredients I’m missing to my shopping cart when I go grocery shopping tomorrow, at least for a few. Not a lemon fan so I’ll be skipping that one likely. As soon as I do try some, I’ll let you know my verdict. Pretty much the only way I’m willing to mix them up is with a wire ball blender bottle. OCCASIONALLY I’ll break out the bullet blender, but only on a rare occasion (like this morning’s iced coffee vanilla mocha experiment, which was awesome and described at the bottom of this post). Melaleuca’s Proflex – Easily my favourite, but not as available to me as they used to be. It comes in Chocolate and Vanilla. 20g of protein, 2g of sugar, and 5g of fat. It mixes up smooth and thick. $24.50 for non Preferred Customers, 16.99 for Preferred Customers, 15 servings, $1.64 / $1.13 per serving. Mixes great with just water. Only available online. GNC Total Lean Lean Shake 25 – Second on the list. Comes in Chocolate and Vanilla. 25g of protein, 4g of sugar, 3g of fat. Smooth and thick-ish. $42.99 for non-gold card holders, $34.39 for gold card holders, 16 servings, $2.67 / $2.15 per serving. Another one that’s fine with water. Available in store and online, only at GNC. PureProtein 100% Whey – A good easy to get option as it’s sold lots of places. Comes in Chocolate, Vanilla, & Cookies N Cream, I’ve only tried the vanilla so far. 25g protein, 2g sugar, 2.5g fat. Can be gritty, but I discovered that using a sifter (like for flour) takes care of that a lot. Not as thick as the others, but okay. I can’t remember exactly how much this is, but I’m pretty sure it’s less expensive than the other two mentioned so far. It’s available at TONS of stores including WalMart, Target, and the Kroger family stores. 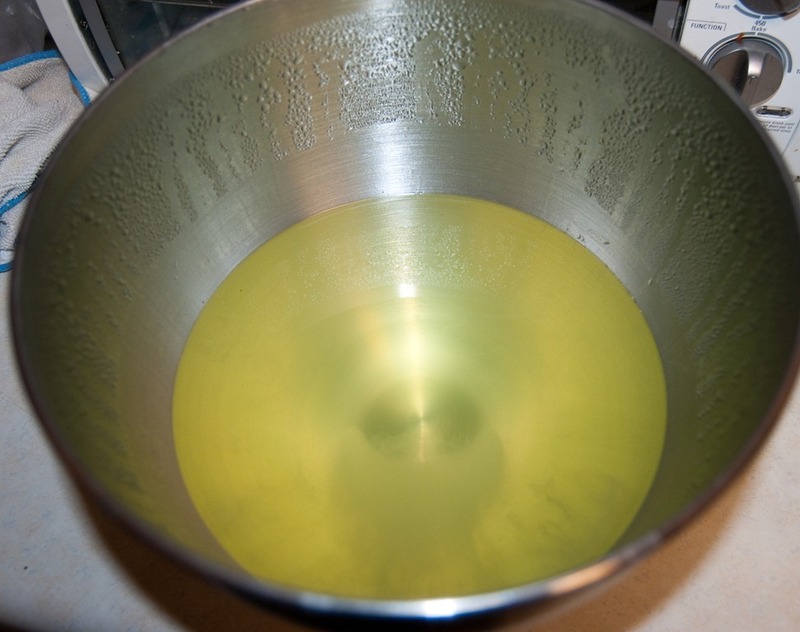 Mixes fine with water. BSN Lean Dessert – Super yummy. Comes in Banana Cream Pudding, Banana Nut Bread, Chocolate Coconut, Chocolate Fudge Pudding, Fresh Cinnamon Roll (the only one I’ve tried), Whipped Vanilla Cream. 21g protein, 2g sugar, 3.5g fat. Smooth and thick-ish. SRP is $31.99 for 18 servings. I’ve seen in less at my local health food store, but don’t remember the exact price. ~$1.78 per serving. Fine with just water. It’s available online, @ GNC, at my local health food store, so probably a number of places. These are ones I have to ‘alter’ to enjoy them, or just choke down. For chocolate ones, I find adding cinnamon is yummy, vanilla ones I add root beer extract, I made one I like with fresh brewed iced coffee and that may work for some of these too. If you don’t like one, try adding a sweetener. I know for ME, that usually that helps a lot. A spoon of Truvia or Splenda, etc. Bariatric Advantage – Yeah, not feeling the love. I’ve tried the Chocolate, Vanilla, Strawberry, Banana, and Orange Cream. Also comes in Iced Latte and Unflavoured. 27g protein, 0.5g sugar, 2g fat. Thin, grainy – haven’t tried the sifter trick with these, I hadn’t discovered that yet. $59.95 for 35 servings. $1.71 per serving. Available online and maybe at your doctor’s office. Had to add sweetener or flavour to make these palatable. Revial Soy – While I love their soy chips, I don’t love their shakes. Comes in Chocolate, vanilla, strawberry, cappuccino, peach, banana, strawberry banana, blueberry, and plain. The unsweetened and sucralose versions have 20g protein, 1g sugar and 1g fat. There is a fructose sweetened version. Another thin and grainy one. $33.59 for 15 servings or $59.99 for 30, $2.24 / $2.00 per serving. 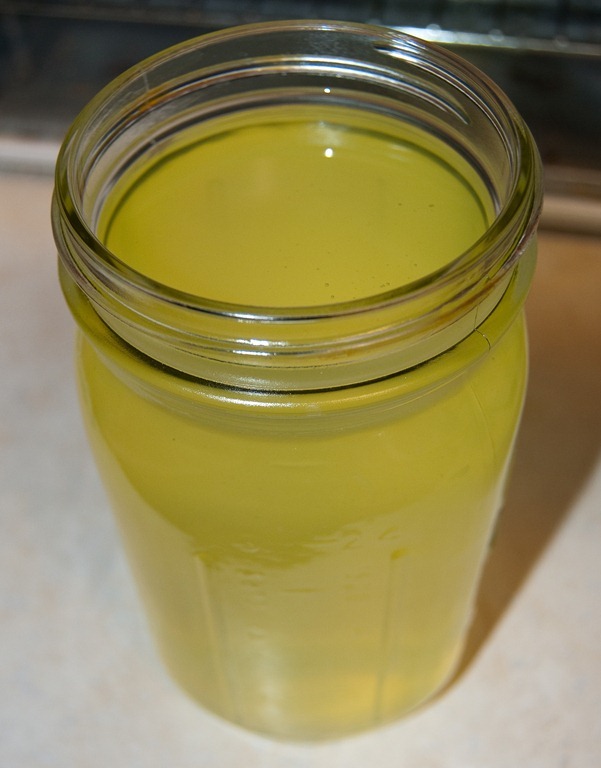 Adding sweetener or flavour made these drinkable, but only barely. This morning I mixed up a yummy concoction that triggered this post. I brewed iced coffee, used that as the water and then blended it with vanilla and a spoon of my kids’ no sugar added chocolate milk mix. Oh, and added a little Truvia. YUM. Iced coffee with protein basically. Turned out really good. I’ve already mentioned that adding a little sweetener can help, unless the problem is that a shake is TOO sickly sweet for you. I don’t have that problem so can’t help there. Some shakes are improved by simply mixing them with milk instead of water, so that’s something to try. Flavours are also another trick, but you almost always want to add sweetener with them, unless, of course, they’re too sweet for you to begin with. Vanilla – root beer, orange, almond, more vanilla, maple.Chocolate – orange, raspberry, mint, or try just sprinkling some cinnamon in. There are a LOT of other brands out there, these are ONLY the ones I have tried. A lot of people swear by the Nectar brand, I just haven’t gotten my hands on any of those yet.